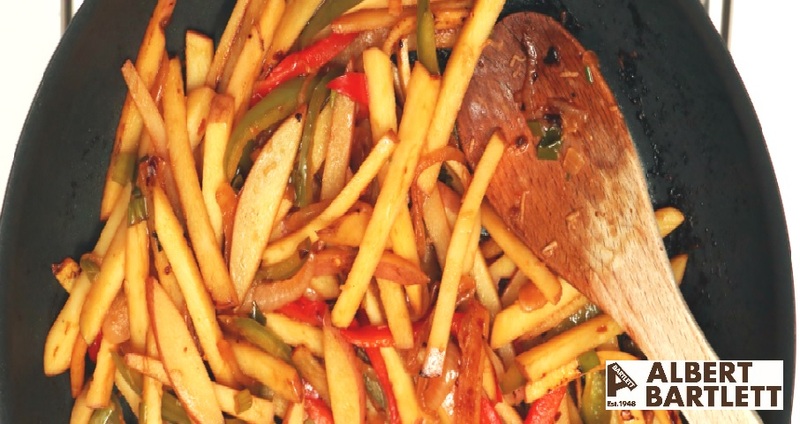 Cut the Rooster potatoes into thin matchsticks and place in a microwavable bowl of hot water. Cover the bowl and microwave on high for 3 minutes. Drain the potatoes and leave to steam dry in sieve or colander. Heat sesame oil over a high heat in a wok with a lid. Add the onion, garlic and ginger then saute for 2-3 minutes until softened. Add the potatoes with soy sauce and rice wine vinegar, then cook for a further 2-3 minutes with the lid on. Next, place the pepper in the wok and stir through the chilli flakes and spring onion. Cook for a final 4-5 minutes or until the potaotes are cooked through. This is a useful basic recipe that the kids will love and takes no time to cook. You could bulk it out with more veggies such as carrots, baked beans, broccoli florets, chopped green beans or peas, depending on what you have in the house. Functional Fuellers eat to live, as opposed to live to eat. Food is not always top of your priority list but you don't like the idea that you could be wasting food that could be eaten. You believe that together we can make a difference, and you value quick and easy wins that we can all do every day. If you have a couple of apples/pears that are turning, chop them into wedge shapes, arrange them in a ovenproof dish lined with butter and layer with any dried fruit or frozen berries you have, as well as some lemon juice and honey if you have any. Cover and put them in the oven on a low heat before you start cooking your dinner, then by the time you've finished and done the washing up you'll be able to enjoy delicious hot apples. Even yummier served with vanilla ice cream.